Buffalo and Erie County Historical Society, behind the freeway. Yesterday I wrote about Rust Belt city planning in general. As I was looking through my Buffalo photos for the post I came across the photo above. Can there be a better illustration of the insanity of building freeways through parks? The huge bright green freeway signs in front of the only building remaining from Buffalo’s Pan-American World Exhibition (1901). Looking over Delaware Park’s Hoyt Lake from the Casino towards the Buffalo and Erie County Historical Society building … and there they are, the huge green freeway signs. Of course the freeway also generates noise and pollution in addition to creating a wall that splits the park into pieces. Many will argue that once a freeway is in place you can’t remove it, but Portland and San Francisco both did and have not looked back. (Check out the great StreetFilms on San Francisco’s Embarcadero Freeway replacment). Previously I wrote about tearing down several Buffalo freeways, maybe that’s too much to start. How about this? Just close the freeway between the Elmwood exit and Parkside. Just this summer. Give people plenty of warning. Install some improvements (and directions) on alternative routes and give it a chance. Create a Buffalo Beach, just like Paris. Here’s a fine article “Our Waterfront, Ourselves” by Bruce Fisher about what to do when a large big box retailer pulls out of a waterfront development project. This has been a shock to Buffalo’s planning and development community – providing for lots of discussion and questions (be sure to read the comments). An excellent feature is that Fisher starts from the – should be obvious – point that the Buffalo area is shrinking and therefore whatever is done needs to be quite different from what’s done in growing regions. Hmmm… why don’t we ever think this way in planning school? Too many cities chase the chimeras de jour – festival marketplaces, downtown ball parks, convention centers, casinos, … all big plans that capture the imagination but fail to spur city economies. In this context Fisher’s suggestion that funds be spent to clean up the water, increase public access and encourage local initiatives rather than subsidizing big box retail and parking make lots of sense. Fisher’s article is refreshing as both planning theory and in Buffalo’s public debate over this important issue. On a recent trip to Buffalo I visited the Buffalo State Hospital grounds in an early, jet-lag induced, walk. Some of my photos are on my Buffalo flickr set tagged with H.H. Richardson: Buffalo State Hospital. As I grew up the imposing main building (in the photo above) seemed always to be in view. We lived nearby and went to elementary school on the campus of the adjoining state college. It’s a fantastic building, unfortunately it really seems to need repair. Here’s a page with information about the complex from the website Buffalo as an Architectural Museum: Richardson Olmsted Complex. 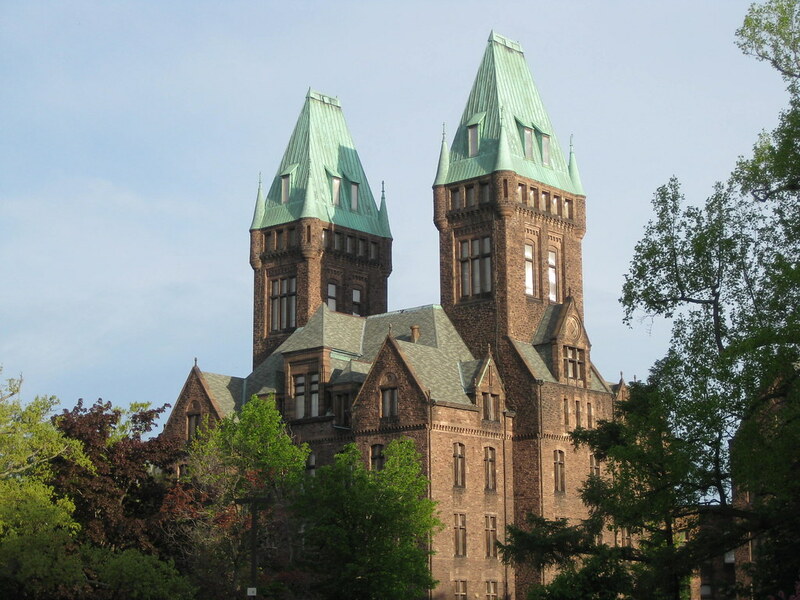 I particularly enjoyed the essay by Francis R. Kowsky, a Buffalo architectural historian, called A Towering Masterpiece: H.H. Richardson’s Buffalo State Hospital. The Infrastructurist just published a column on seven freeways to demolish. One of the freeways is Buffalo’s Skyway. As a native of Buffalo I agree with Michael, who commented on the great views from the Skyway. But … why stop at tearing down the Skyway in Buffalo? Interstate 190 goes north from the Skyway cutting the city off from LaSalle Park and continues along the banks of the Niagara River … what could be a magnificent riverfront. 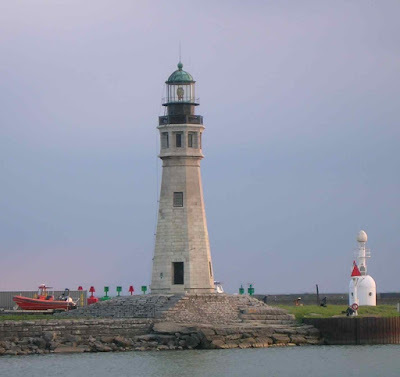 The lighthouse above is on the shore of Lake Erie at the Coast Guard station. Next up, Buffalo’s Inner Beltway. 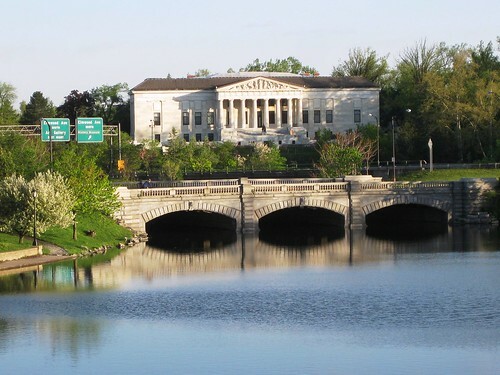 Let’s start with the Scajaquada Expressway (NY 198), running along Scajaquada Creek through the Fredrick Law Olmsted Delaware Park (!!!). Then the depressed freeway in the Olmsted-designed Humboldt Parkway (I guess it was OK to put a freeway through the parkway in the African American neighborhood but not the one in the mansion district: Chapin Parkway). Figuring out how to deal with the traffic would take some creative transportation planning, but maybe what Buffalo really needs is some bold thinking for the future.